A young girl, sun shining through the clouds behind her as she sits on a hill, blanketed by the thickest and greenest of grass. 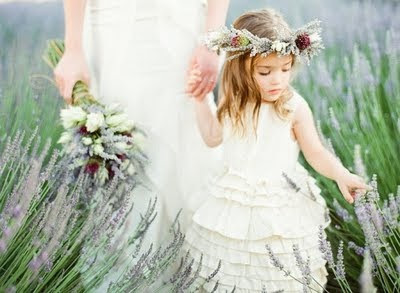 The wind blows through her hair, smelling sweet of lilac, as she carefully, delicately, creates a wreath of flowers which she places on her head. This. This is a picture that I have had stowed away in the recesses of my memory since I was a child, undoubtedly placed there by Anne of Green Gables and episodes of Little House on the Prairie. Try as I may, I was never able to make such a wreath. Flowers are delicate and too much manipulating and soon those flowers are just a pile of stem and petal in my hands, stained yellow from the pollen. You have to be careful with flowers. I don't sit on a hill and crochet flowers into crowns. My hills are asphalt and my time is short. But words, I will craft my words and find within them wreaths, necklaces, anything I choose or can conjure up. I will sew, oh so carefully, these letters together and make a garland. And this garland, this small piece of beauty in a world so often dark and cold may be offered up to you. I will offer them to you, with trembling hands, for you to hold in yours. You have to be careful with words. I want to sit with you, and share. I want to trust you enough I can pass my words to you and know that you will watch over them, that you will keep your hands open, being careful not to crush them. I want you to see the beauty in them. I want you to ask me about them. You don't have to agree with them....really, you don't. And here's what's so scary. You might not like them at all. Not one bit. But don't throw them away. Don't toss them away. Remember that someone put time into them. Someone dared to peel back the layers and share some of the deepest parts of themselves. Or maybe it was just a reflection on the day, full of light and glimpses of dimpled cheeks and blonde ringlets. It really doesn't matter. They still deserve care. For I will take care of your words. I will read them. Think about them. I will look at them, in all of their beauty. I might share them. I might hold them up to my little corner of the world and say, "Look at these words, drink them in. Let them settle into the corners of your soul." Because that is how you handle words. Or I might not like them at all. Not one bit. I will still appreciate these words, but more so, I will appreciate you, the artist that wove them together. I will be grateful that you esteemed me enough to share them with me. And for that I say thank you. I'm 38 years old. I don't have time to live in a Utopian world. I'm 38 years old. I will make my world what I want it to be. Resistance has been pressing hard around me. I've been frozen, fearful of writing out my words. Unable to create my garland. Today. Today I pushed through. I don't need approval. These are my words to speak. My flowers to weave. We all want to be seen. To be heard. To have the respect of our peers. I know. I know. This is finding those people that believe in you. Who hear the beauty in your words. I'm finding my people. Come to the hill. Be it soft grass or concrete and asphalt. Come. Share your stories. Shout it out. I'm here to hold your words, the garland that they are. We are here, turning our flowers into crowns.